It is easy to spend all day every day inside in the laboratory and so it is nice that we take opportunity to go out and look at the rising sun over the Indian Ocean every day after breakfast. It has been quite cloudy until this point but over the last couple of days we’ve had good luck and the sunrise has been clear, or at least as clear as can be expected in these latitudes. 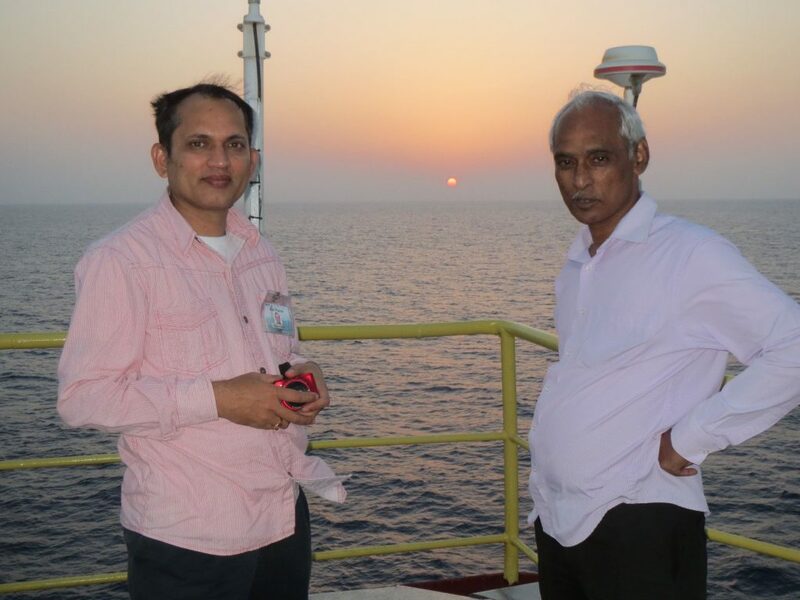 Here we can see Ravi Mishra (sedimentology) and Tallavajhala Radhakrishna (igneous petrology) are looking at the sunrise from our position on the Steel Beach over the bridge. It’s a nice opportunity to sit and chat and we actually had some quite animated discussions about the monsoon and its development there in just a few minutes. Perhaps the fresh air and the breeze in our faces is doing us some mental good!